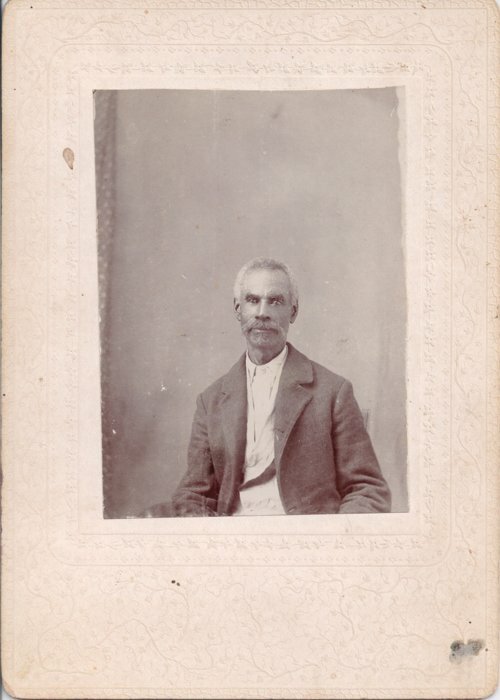 This is a photograph of Andrew Gayden, the son of Ellen Maddox Gayden and Jefferson Gayden. He was born in 1872 on a plantation in Carroll County, Mississippi. Andrew Gayden's parents and other relatives came to Kansas. They came to Topeka and later moved to Dunlap, Kansas. Andrew later settled in Kansas City, Kansas, where he worked in the stockyards. He married Frances Jane Johnson in Council Grove, Kansas, on October 1, 1903. When Frances was expecting a child, they moved back Dunlap where Andrew was active in the community. He died on June 24, 1935, and is buried in Dunlap, Kansas.